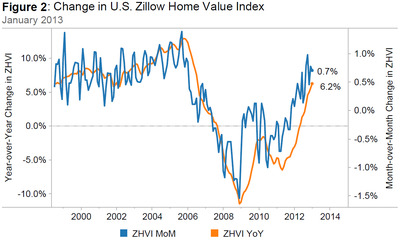 According to Zillow, U.S. home prices rose again in January. In fact, we’re witnessing the fastest pace of price growth since July 2006, which was during the housing bubble. Zillow’s January Real Estate Market Reports, released today, show that national home values rose 0.7% from December to January to $158,100 (Figure 1). January 2013 marks the 15th consecutive month of home value appreciation. 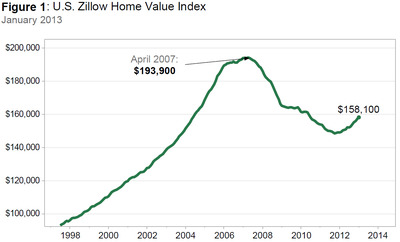 On a year-over-year basis, home values were up 6.2% (Figure 2) from January 2012 – a rate of annual appreciation we haven’t seen since July 2006 (when the rate was 7.5%), before the peak of the housing bubble. Rents are up 4.3% on a year-over-year basis (Figure 3). The Zillow Home Value Forecast calls for 3.3% appreciation nationally from January 2013 to January 2014. Most markets have already hit a bottom – with only 9 out of 260 not projected to hit a bottom within the next year – and 78 out of the 260 markets covered are forecasted to experience home value appreciation of 3% or higher.